Tattoos are Ã la mode and people around the globe get them to beautify their body. Hereâs someone who got inked for charity. 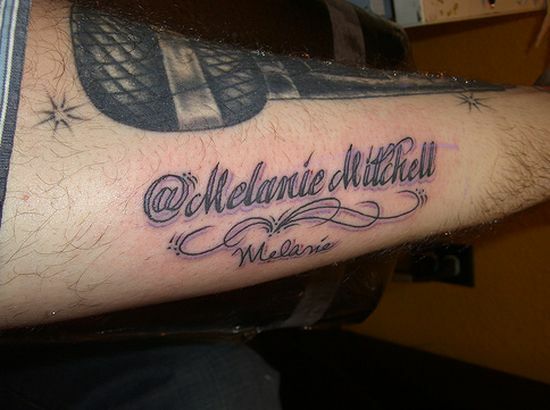 Few days ago Drew Olanoff offered to get a tattoo of the Twitter user name of the person willing to donate the maximum amount to the Make-A-Wish foundation. Melanie Mitchell was the one who won with a bid of $2112. As promised Drew got her user-name inked down at Cold Steel. Owl Tattoo- Bizarre or cool? English tattoos-Hot trend among Chinese! Microsoft Zune-Zune tattoo guy’s new name! Cute Hello Kitty Tricycle Tattoo! 6X9=42: Math Tattoo or Confusion Tattoo? ← Colorful heart and star tattoo-Token of friendship!